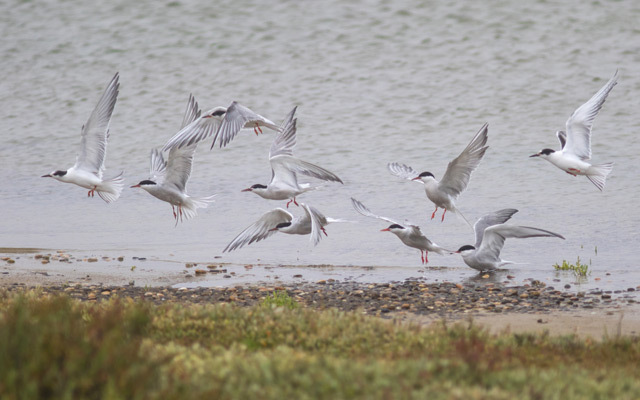 Although we've had more than our fill of rain in the last fortnight the latest dose was welcome for dropping a good quantity of migrants around the south of the island; this, taken with the continuing presence of two of yesterday's scarcities, provided plenty of bank holiday entertainment. 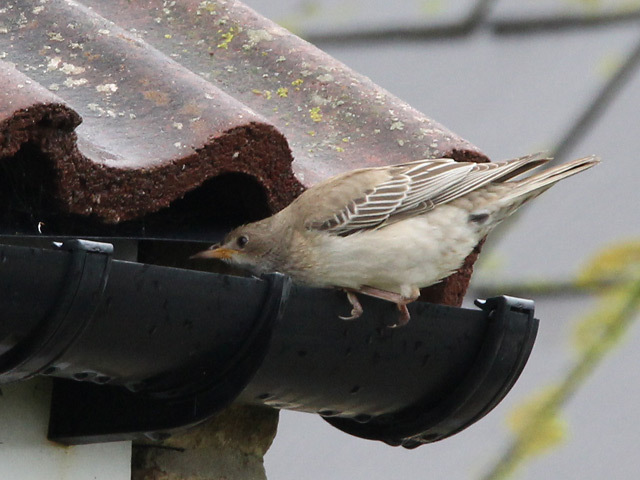 The Rosy Starling didn't get south of Southwell today but remained ensconced around the houses at Reap Lane; the Bill Wryneck was usually more obliging and remained on station at the Pulpit Bushes all day. 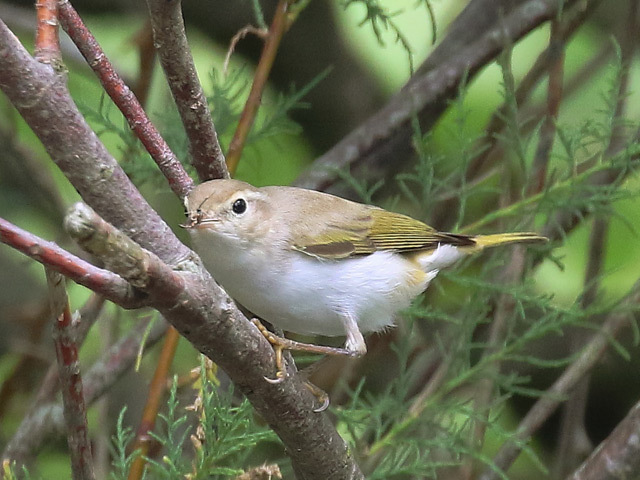 Good coverage of the Bill area came up with 100 Wheatears, 60 Willow Warblers, 40 Whitethroats, 30 Spotted Flycatchers, 25 Yellow Wagtails, 15 each of Tree Pipit and Whinchat, and 6 each of Redstart and Pied Flycatcher, whilst amongst the lower totals there were 2 Grasshopper Warblers and singles of Snipe, Short-eared Owl and Black Redstart; elsewhere, interest came in the form of a Green Sandpiper at Ferrybridge, another Black Redstart at Blacknor and 2 Nightingales at Suckthumb Quarry. 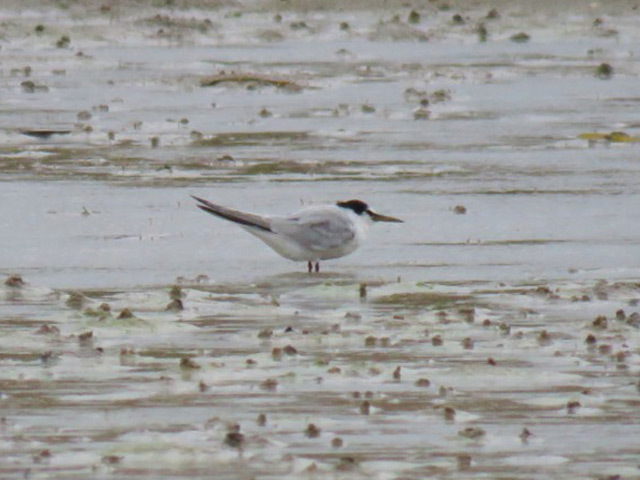 The sea was quieter than of late, with just 18 Balearic Shearwaters and 6 Gadwall of note off the Bill. The calm, damp conditions overnight saw some notable immigrant totals reported from the moth-traps, with, for example, year peaks to date at the Obs of 61 Rush Veneers, 26 Dark Sword Grass and 5 Scarce Bordered Straw; another Convolvulus Hawk-moth also made it into the traps there, with further individuals visiting Nicotiana flowers there and at the Grove after dark. A great little selection to liven things up today, with a Rosy Starling roaming widely between the Bill tip and Reap Lane after initially being discovered in the Obs Quarry, yesterday's Melodious Warbler showing up again in Top Fields, an Osprey heading south over Weston and the Bill and a likely new Wryneck popping up at the Pulpit Bushes. Grounded common migrants still weren't at all plentiful and didn't include anything much better than 3 Grasshopper Warblers and a Pied Flycatcher at the Bill, but it was busier overhead, with a steady passage of hirundines through everywhere and 40 Yellow Wagtails, 22 Tree Pipits, 13 Swifts and the autumn's first Short-eared Owl over the Bill. Balearic Shearwaters were again conspicuous, with at least 130 through off the Bill where 2 Great Skuas and an Arctic Skua also passed by. 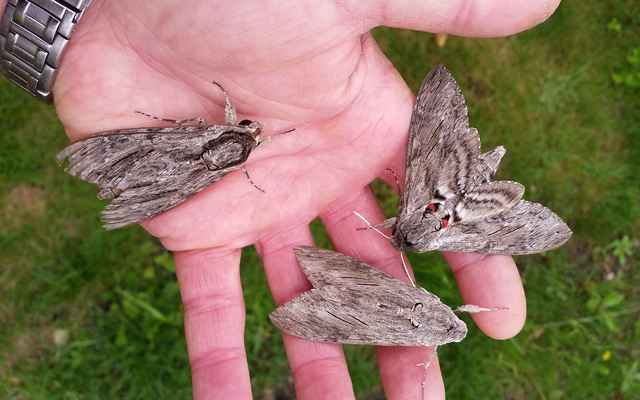 After yesterday's action there were high hopes for the moth-traps, but despite nice conditions 4 Vestals at the Obs and a Convolvulus Hawk-moth at West Grove Terrace were the best of the immigrants. ...and oddities such as a Common Sandpiper engaging in some song; passerines included plenty of Tree Pipits and a probable Pied Flycatcher. 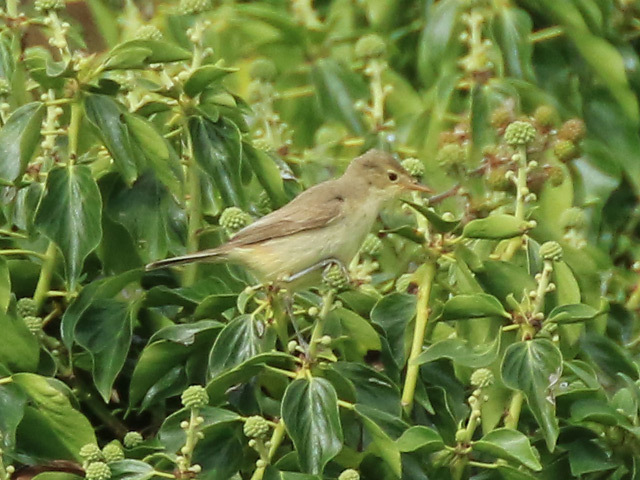 At most sites a Melodious Warbler - today's bird popped up in Top Fields but disappeared almost as soon as it was found - would have seemed like a decent enough reward in promising-looking conditions, but this being Portland there was a feeling that perhaps there should have been something better on offer. 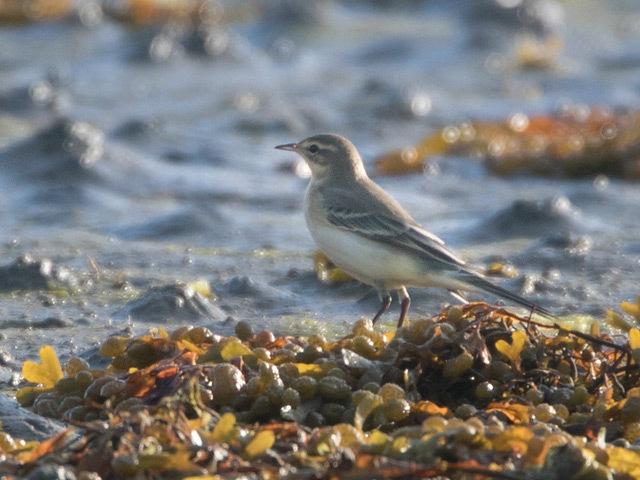 Routine migrants weren't particularly well represented, with the only double figure totals (hirundines aside) at the Bill being 50 Yellow Wagtails, 30 Whitethroats, 20 Wheatears, 16 Grey Wagtails, 15 each of Tree Pipit and Whinchat, and 10 Willow Warblers; 3 Grasshopper Warblers, a Yellow-legged Gull and a Nightingale were the best of the rest. 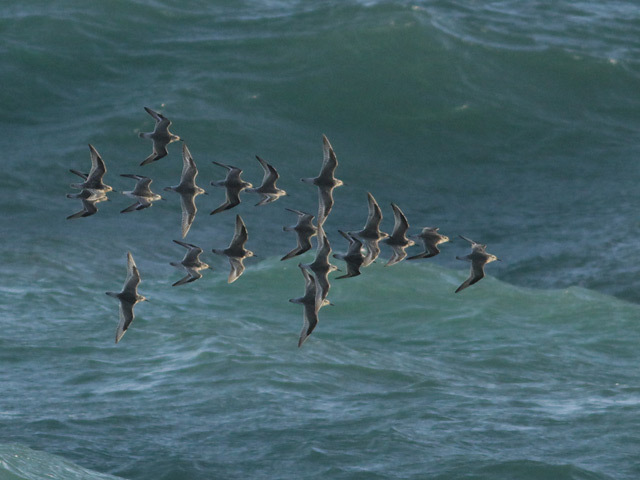 Balearic Shearwaters maintained their presence offshore, with at least 20 through or lingering off the Bill. 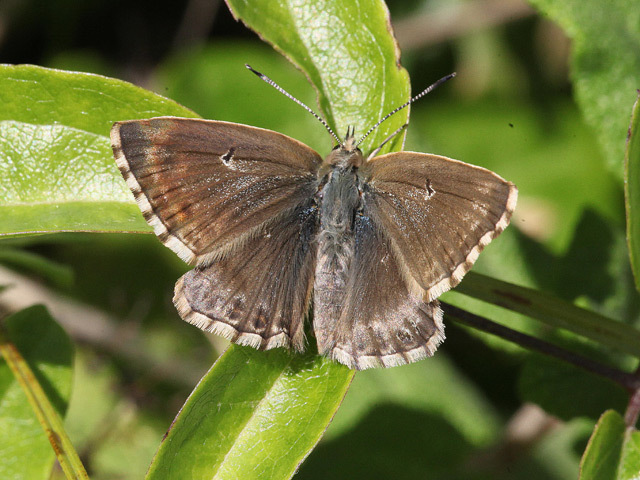 There was an encouraging hint from the Obs moth-traps of longer distance immigration underway, notably in the form of an Old World Webworm; singles of Ni Moth at the Obs and Striped Hawk-moth at St Peter's Church were perhaps more likely to have been locally bred. 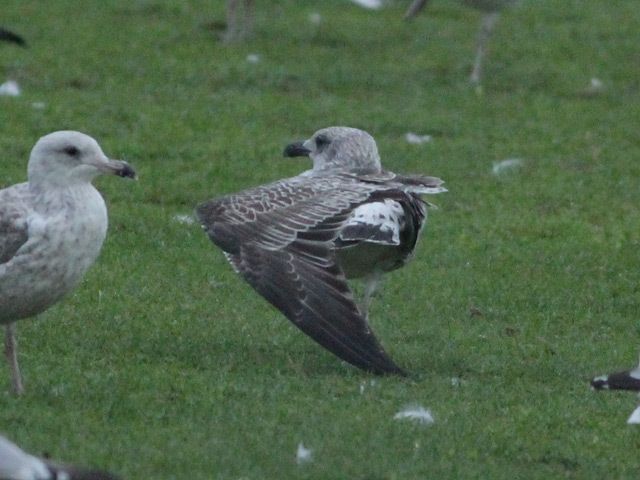 ...traditionally, Portland Yellow-legged Gull records start to fizzle out towards the end of August so we were pleased to see this juvenile - now well advanced to first-winter plumage - at the Bill towards dusk this evening; we're not sure we actually have any records of confirmed first-winters during the late autumn/winter months at Portland, so what happens to all the Yellow-legged Gulls that arrive in southern England during the late summer - do they just move on into inland anonymity for the winter or do they head back south again? Although the Old World Webworm is pretty obviously of relatively distant origin we were also intrigued to catch a peculiar sandy-coloured Nutmeg that bore a more than passing resemblance to the similarly-coloured individuals caught out of season during the winter influx of Levant Blacknecks and other rare immigrants some years ago; 2 very pale Delicates today (as yesterday's individual also was) also looked likely to have been of distant origin. A crystal clear night and bright, sunny day was extremely welcome after such a soggy week but didn't do much for dropping migrants - but it was certainly a pleasure being out looking for what few there were. 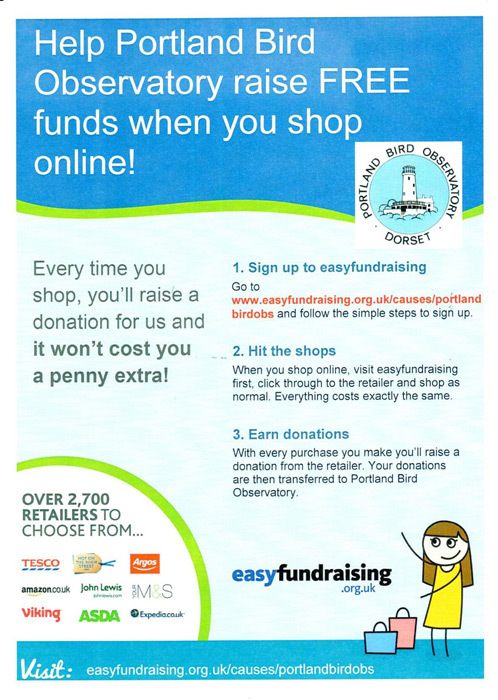 It was actually the sea the came up with the day's main interest, with a strong showing of Balearic Shearwaters off the Bill: a steady westward passage through the morning totalled 96, before a gathering of at least 50 lingerers appeared in the tide race; 2 each of Arctic Skua and Great Skua also passed through there. 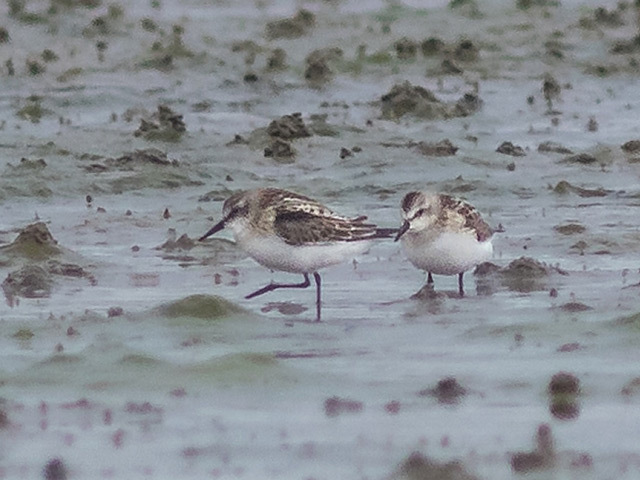 Although there was a limited visible passage overhead, including at least 40 Yellow Wagtails and 5 Grey Wagtails over the Bill, the land was the poor relation: a Green Sandpiper at Coombefield Quarry and a Nightingale still in the Obs Quarry were the best of the scarcer migrants, whilst none of the commoner migrants even managed a double figure total at the Bill. 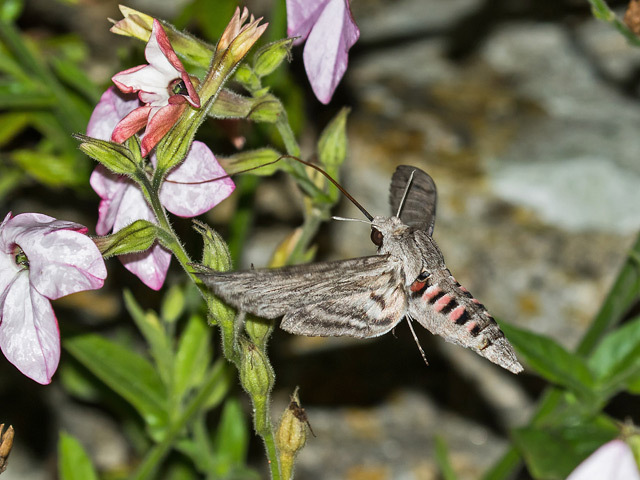 The moth-traps were busier than in recent nights but immigrant numbers were still far from impressive, with singles of Delicate, Bordered Straw and Scarce Bordered Straw the pick of the Obs catch; at dusk at least 2 Convolvulus Hawk-moths were visiting Nicotiana flowers at the Obs. A very thin list of migrants again today, with birding hardly helped by a good part of the morning being another washout. The Wryneck at the Higher Lighthouse surfaced again but by all accounts was very elusive, whilst a Nightingale at the Obs Quarry and 12 Knot at Ferrybridge were the pick of the few new arrivals; amongst the commoner migrants only Whitethroat and Willow Warbler managed a creep into double figures at the Bill, and at the Obs the mist-nets came up with just 2 new birds - both Robins - all day. The sea was considerably quieter than yesterday, with 21 Balearic Shearwaters and a single Arctic Skua the best on offer off the Bill. After steady rainfall through the night and a clearing up shower during the morning that wasn't far short of a biblical deluge it was no great surprise to find new arrivals thin on the ground once the clearance came. 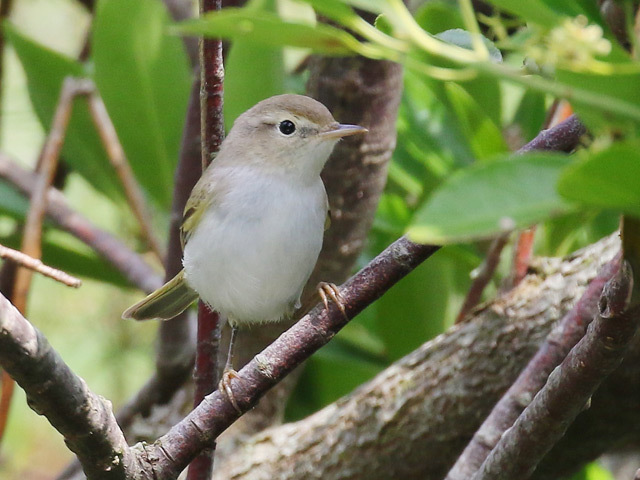 To our surprise though one of the first captures in the Obs mist-nets was a Western Bonelli's Warbler - seemingly the bird from last weekend surfacing again; having not been seen for three days (although the conditions have hardly been favourable for phylloscs showing themselves) it's clearly a pretty furtive bird and remained true to form by not showing again after release. 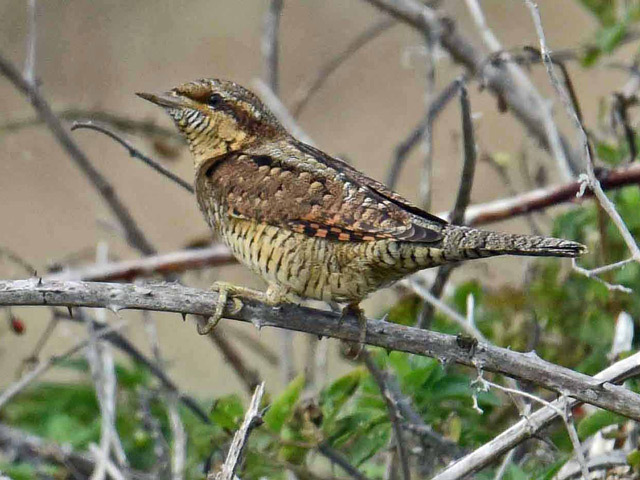 Considering the paucity of newcomers (only 3 other birds were ringed all day at the Obs) it was also unexpected when a Wryneck showed up later in the day at the Higher Lighthouse. 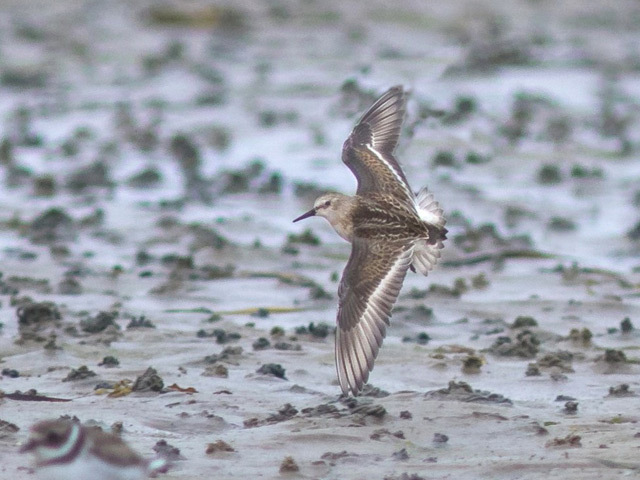 In a fresh south-westerly it was the sea that came up with the bulk of the numbers, with 55 Balearic Shearwaters, 19 Knot and 3 Arctic Skuas the pick of the day's passage off the Bill. 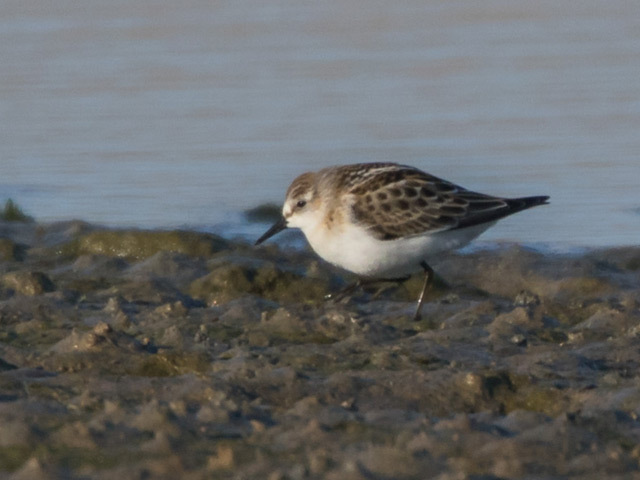 Variety at Ferrybridge included 3 Knot, a Ruff and a Little Tern. 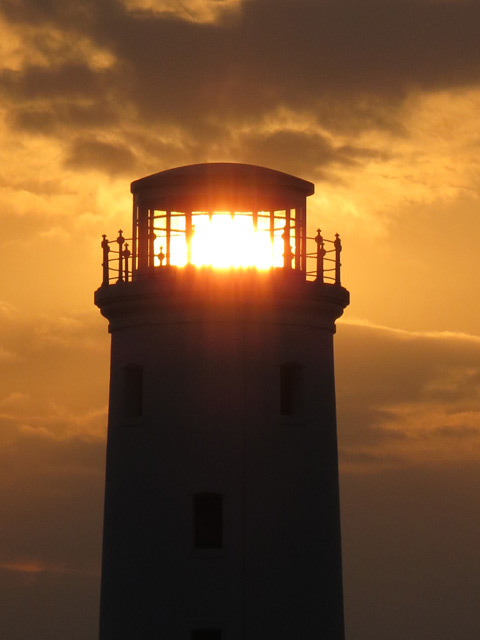 The paltry overnight catch of moths included no immigrants worth a mention. Need we say that it rained again? Today's only redeeming feature was that the dry spells at either end of the day were a good bit longer than they had been yesterday so coverage was considerably better; sadly though, there were far fewer migrants about so the rewards on the passerine front were scant, with Yellow Wagtail the only species getting into double figures at both the Bill and the centre of the island. 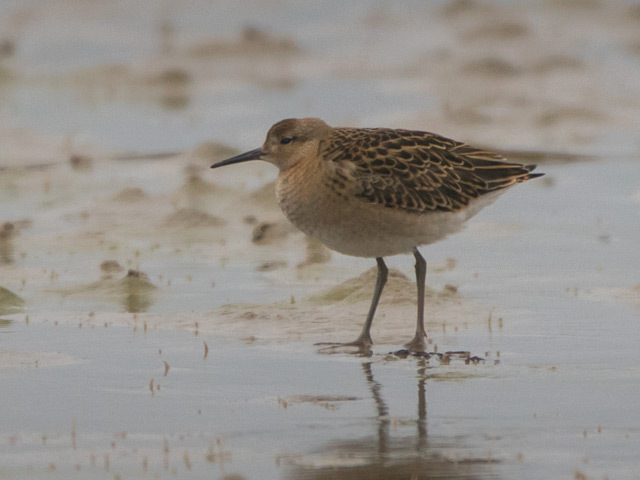 Wader variety did remain a feature, with 8 Black-tailed Godwits, 2 Little Stints and a Ruff the best on offer at Ferrybridge. The freshening wind associated with the weather front that passed through in the middle of the day jazzed up action on the sea, with 40 Balearic Shearwaters, 12 Arctic Skuas, a Great Skua and a Pomarine Skua the highlights off the Bill. 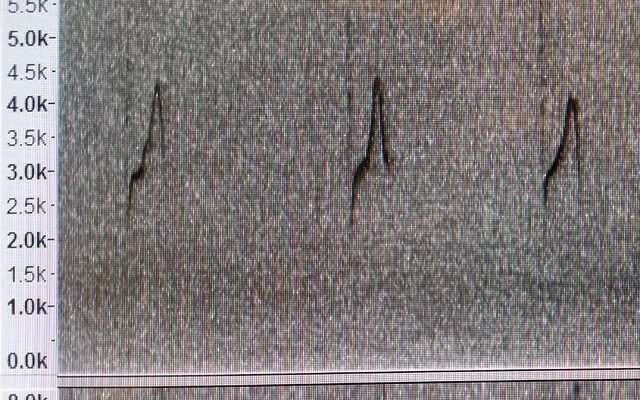 It was far too windy overnight to have expected much in the way of numbers in the moth-traps and 3 Vestals scattered between the Obs and Sweethill were the best of the immigrant tally. 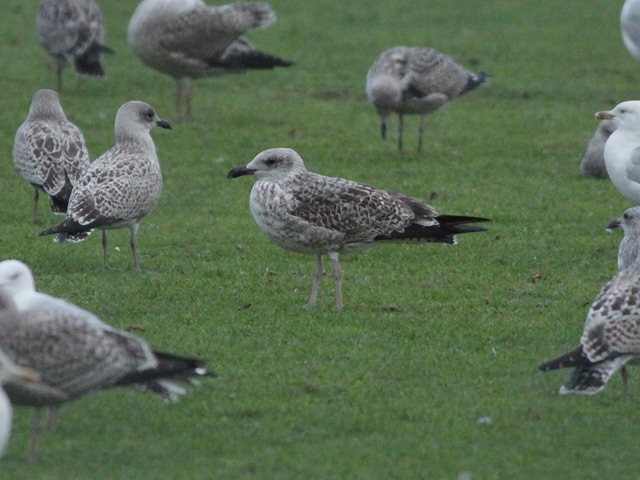 The current weather situation is beginning to get tiresome, with the almost continual rain generated by a depression centred over northern France spoiling attempts to get amongst what looked to be an interesting selection of new arrivals. Ferrybridge at least often comes good when other sites are unbirdable and today proved to be no exception, with a varied throughput of waders and terns in particular that included 4 Little Terns, 3 Ruff, 2 Black-tailed Godwits and singles of Grey Plover, Little Stint, Knot, Common Sandpiper, Spotted Redshank, Black Tern, Common Gull and Yellow-legged Gull; a Green Sandpiper over the Grove was an addition to the wader tally from elsewhere, whilst the Bill came up with 4 Redshanks, 2 Dunlin and a Ringed Plover. 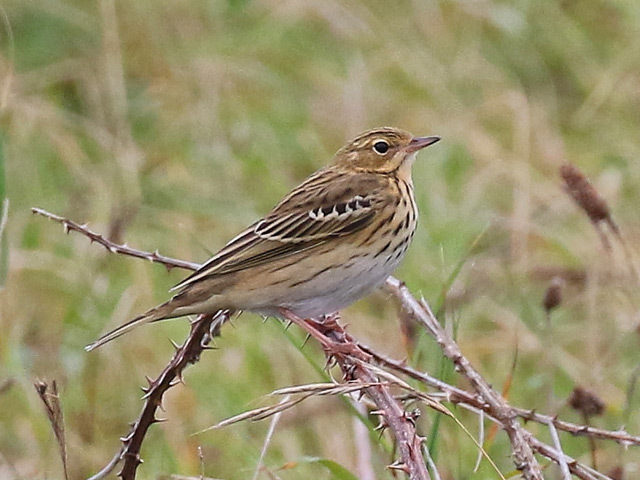 Passerine hunting was really restricted to brief dry spells just after dawn and shortly before dusk, when 40 Wheatears, 15 Willow Warblers, 10 Tree Pipits, 6 Spotted Flycatchers, 5 Whinchats, 2 Redstarts and a Sedge Warbler were among the discoveries at the Bill. Immigrant moths didn't feature in any great quantity, with the tally of individuals from the Obs traps only just scraping into double figures; a Convolvulus Hawk-moth at the Obs and single Vestals at Sweethill and West Grove Terrace were the best of the oddities. 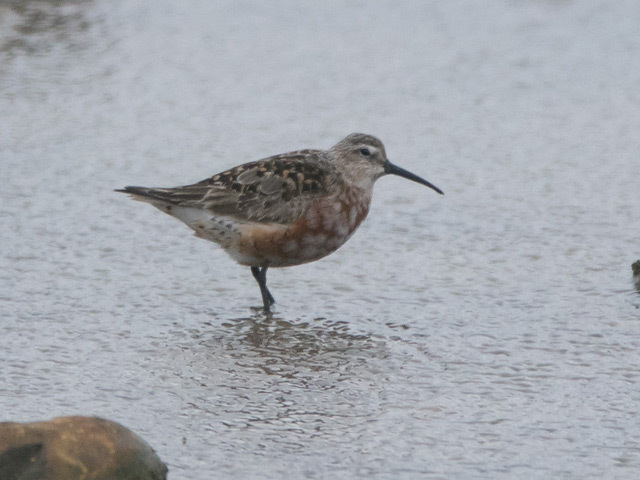 What potential there was today ended up well and truly washed away by a morning of almost continual rain which was great for dropping waders at Ferrybridge but didn't permit any meaningful fieldwork on the land until the afternoon. 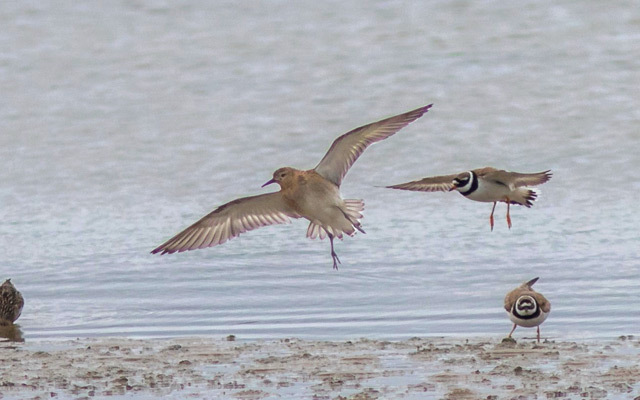 Ferrybridge was buzzing with activity that included what must be a Portland record tally of 70 Redshank; 7 Whimbrel, 3 Knot and a Ruff were the best of the rest there. 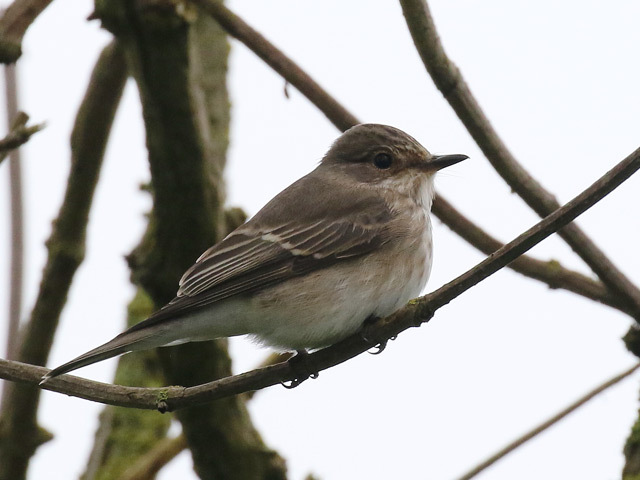 The Bill certainly wasn't busy with new arrivals but a fair bit of late legwork eventually came up with 10 Whinchats, 3 Pied Flycatchers, 2 Redshank, 2 Tree Pipits and singles of Redstart, Reed Warbler and Lesser Whitethroat amongst others. 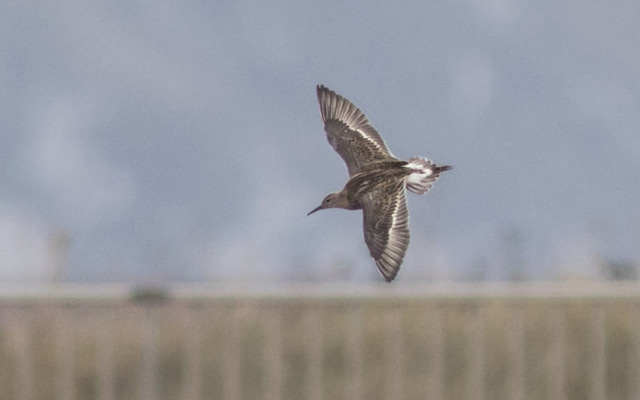 Most of the day's Balearic Shearwaters were moving rather than lingering, with a total of 17 through off the Bill; 52 Dunlin and 2 each of Arctic Skua and Great Skua also passed through there. 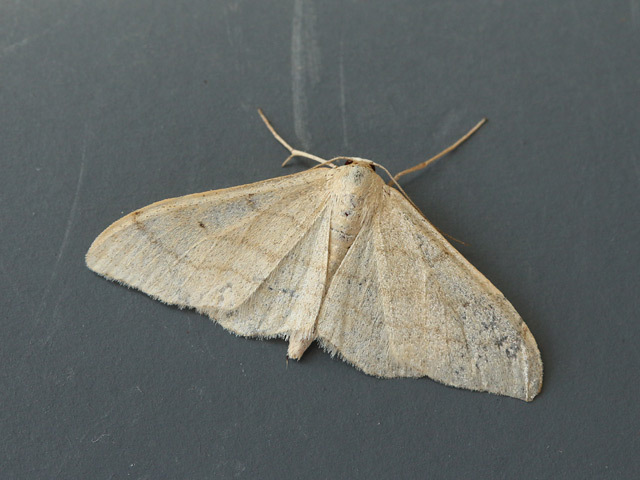 Overnight moth-trapping was not as productive as had been hoped, with singles of Convolvulus Hawk-moth at the Obs and West Grove Terrace, and a White-speck at the Obs the best of the immigrants. 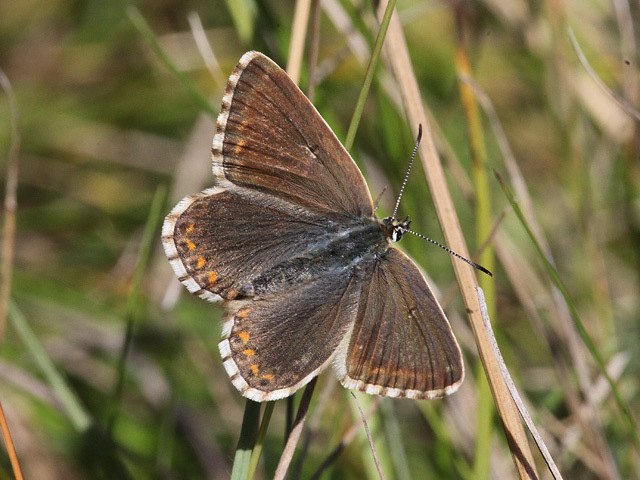 Immigrants by day included a good spread of Hummingbird Hawk-moths and several Vestals disturbed from fields at the Bill. 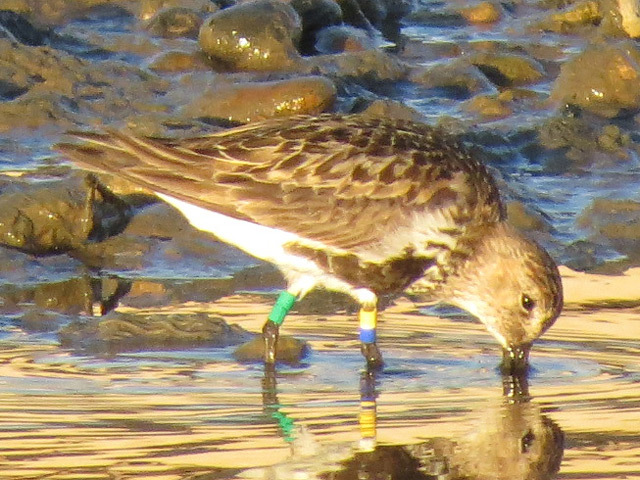 ...it turns out that the bird was ringed on 9th July at Zackenberg, north-east Greenland, and is the first resighting of a bird from this research site. 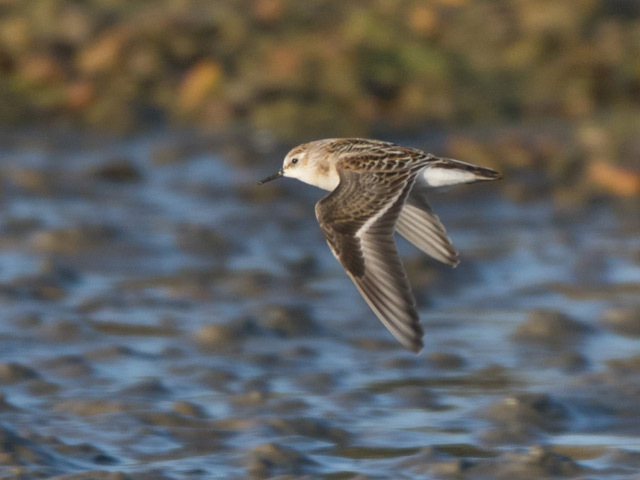 From our reading of The Migration Atlas it seems that this bird will be an arctica Dunlin - a form that has a population of only some 15000 individuals and occurs in Britain only briefly on passage in spring and autumn to and from winter quarters in West Africa. We do still find this sort of stuff pretty staggering: Ferrybridge is hardly big league in the wader stakes, yet amongst the things dropping in there to stage during August there'll just as likely be a Dunlin that a month before was breeding on the edge of Greenland or, as we discovered from a colour-ring sighting last year, a Ringed Plover from a population in high arctic Canada. 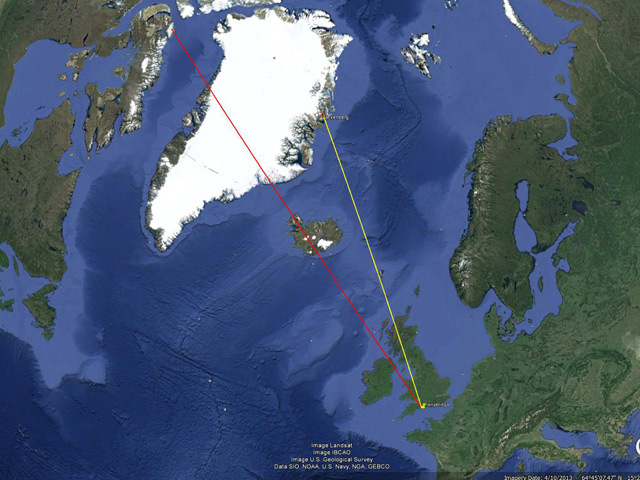 On the map below the yellow line connects Ferrybridge with Zackenberg, whilst the red line shows the connection with Bylot Island - the Ringed Plover's breeding site - in Canada. 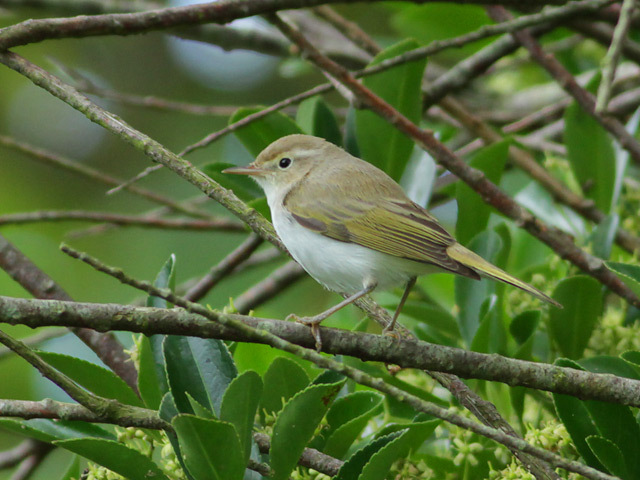 With some pretty interesting-looking weather in the offing and the staple Melodious Warbler already under the belt this week it was probably fair to say there some expectations for this weekend, with the first reward - a Western Bonelli's Warbler - being discovered very promptly in the Obs garden; it remained there all day although became increasingly elusive as the conditions deteriorated through the afternoon. 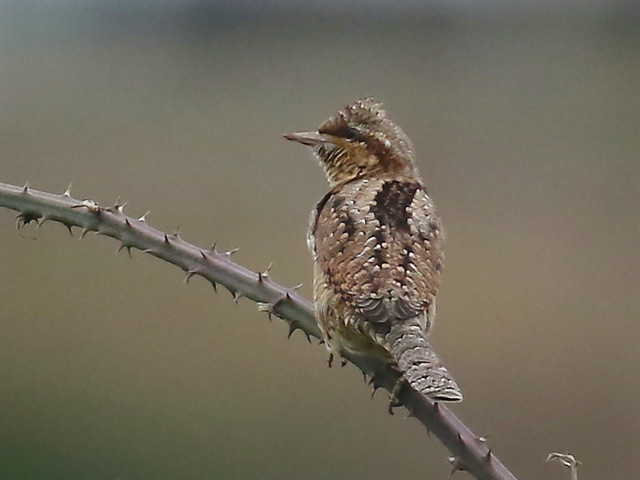 With common migrants still being pretty thinly spread, for a while it had looked like an early morning Little Stint at Ferrybridge would provide the best of the back-ups but during the afternoon a Wryneck popped up briefly at Southwell to round off the action very nicely. Routine fare at the Bill included 15 Yellow Wagtails, 6 Grey Wagtails, 3 Tree Pipits, 2 each of Whinchat, Lesser Whitethroat and Garden Warbler, and singles of Whimbrel and Spotted Flycatcher but no more than 20 Willow Warblers and just a single Sedge Warbler (...they certainly haven't been coming our way so far this autumn); 2 Pied Flycatchers at Southwell and a Great Spotted Woodpecker at Portland Castle were the best of the rest elsewhere. Odds and ends on the sea included 9 Balearic Shearwaters and 3 Shoveler through off the Bill. Mothing was again rather disappointing, with a lone Olive-tree Pearl at the Obs just about the best of a limited selection of immigrants from overnight trapping. 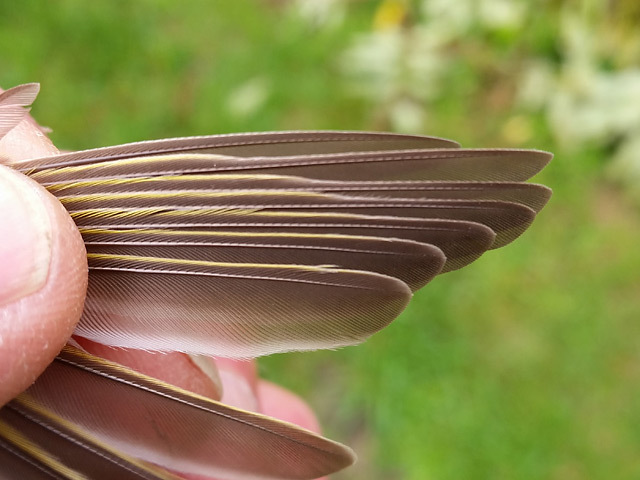 The fact that just 4 new birds were trapped and ringed all day from a combination of the Obs garden and Crown Estate Field mist-nets was evidence enough that there were precious few new arrivals today, with the only morsel of quality in the Bill coming in the form of a single Pied Flycatcher. The sea was a little more interesting, with 9 Balearic Shearwaters again lingering offshore and at least another 29 passing straight through; 2 Arctic Skuas and a single Great Skua also passed by. Immigrant moth interest was also on the sparse side, with a Ni Moth and a Black Arches at West Grove Terrace the only worthwhile return from overnight trapping. Another weather shocker today saw drizzle and reduced visibility dominate proceedings and prevent much in the way of serious fieldwork. 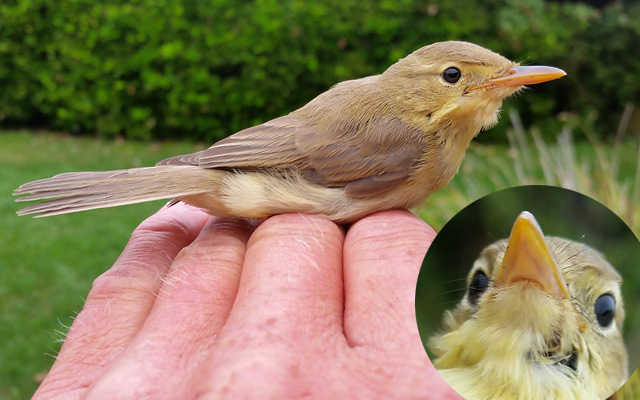 Fortunately it was at times possible to open a few nets at the Obs and they turned up the day's highlight when a Melodious Warbler was trapped late in the afternoon. 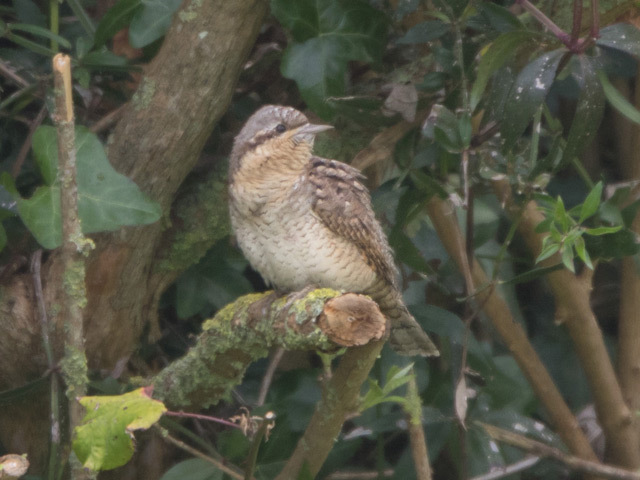 Grounded migrants didn't otherwise look to be at all numerous, with singles of Whinchat and Redstart the best on offer in the Bill area and 2 Whimbrel the pick of the waders at Ferrybridge; a Great Spotted Woodpecker - perhaps the long-stayer - was also at Easton. 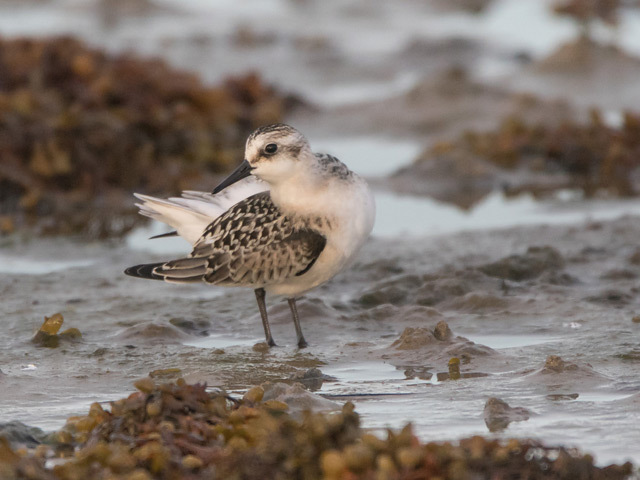 During the few spells that serious seawatching was possible 5 Balearic Shearwaters were still lingering off the Bill, where a lone Arctic Skua also passed through. 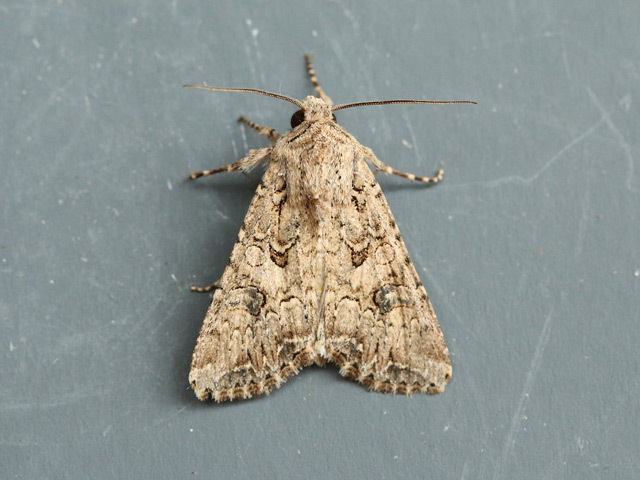 Moth-trapping was for the most past disappointing so the appearance of 3 Convolvulus Hawk-moths and a Ni Moth at West Grove Terrace was a slight surprise. An overcast, calm dawn looked quite promising on the migrant front but it was perhaps fortuitous that it failed to deliver since drizzle and eventually persistent rain soon set in to spoil birding opportunities for much of the rest of the day. 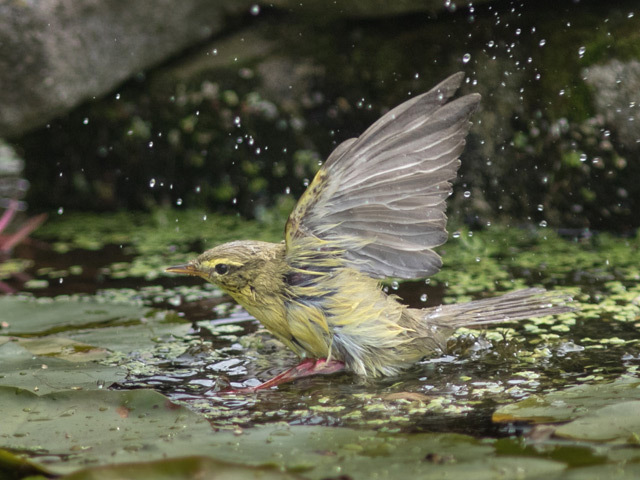 At the Bill, Willow Warblers had sounded to be quite numerous at first light but fieldwork before the rain materialised didn't reveal much else by way of either numbers or quality. A minimum of 9 Balearic Shearwaters lingered off the Bill all morning and a single Great Skua also passed through there. 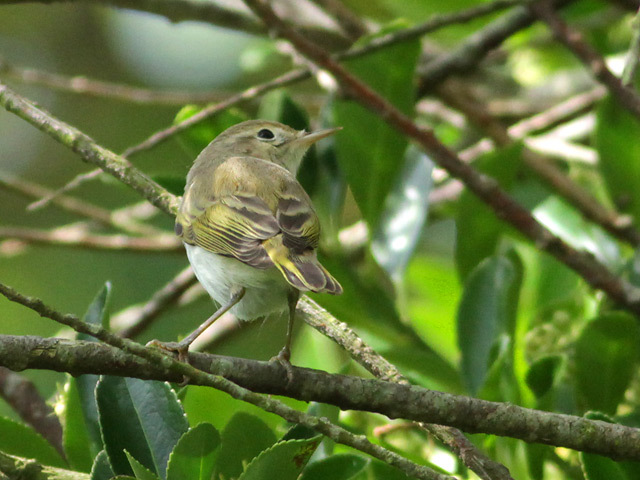 The rather samey run of migrants continued, with a fair flurry of new Willow Warblers - including another 100 at the Bill - but nothing else in quantity bar hirundines and late Swifts overhead. An Osprey that passed over at Blacknor was easily the best of the day's quality, with nothing at all unexpected showing up amongst the passerines on the ground, where the likes of single Pied Flycatchers at the Bill and Avalanche Road were as good as it got. 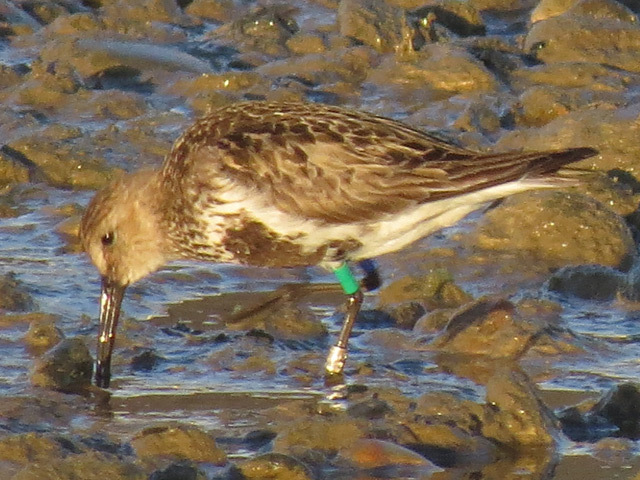 Variety increased a little at Ferrybridge, where 2 Black-tailed Godwits, 2 Greenshank and a Yellow-legged Gull were all new. 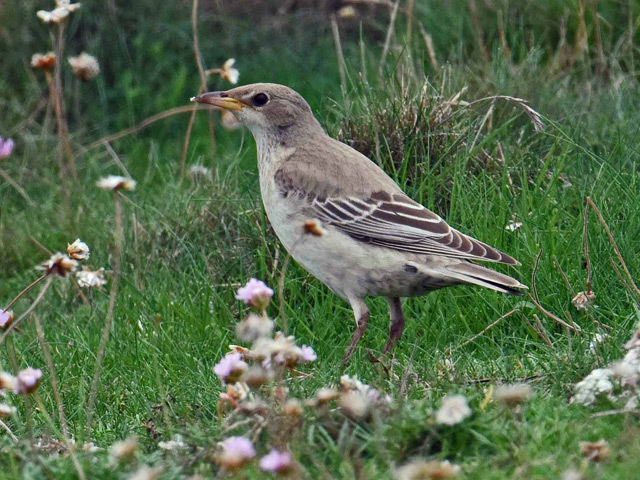 Overhead, the autumn's first Grey Wagtail, along with 12 Tree Pipits, passed through at the Bill and a flurry of late Swifts included 50 over Blacknor. 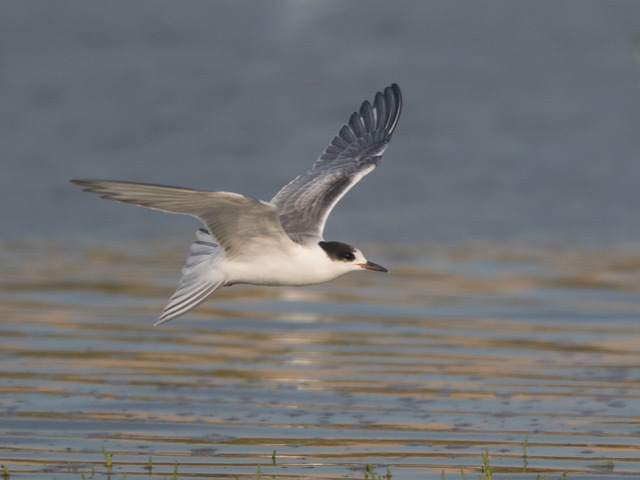 Sea interest was limited to a minimum of 10 Balearic Shearwaters lingering all morning off the Bill, where singles of Great Skua and Arctic Skua also passed through. 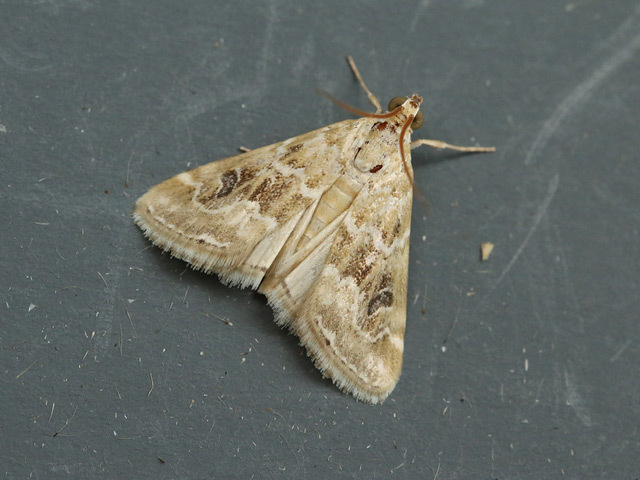 Busy moth-trapping overnight came up with the year's first White-speck at Weston and a Convolvulus Hawk at the Obs but new immigrants were otherwise poorly represented. The current new moon period has seen its fair share of reasonable little falls of migrants but the sky was perhaps just too clear to have expected much at dawn today. 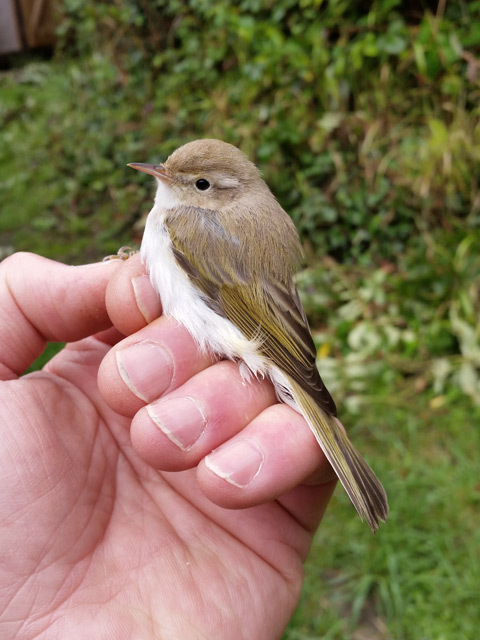 A fair spread of Willow Warblers was still evident, with upwards of 75 again at the Bill, but 4 Pied Flycatchers between the Bill and Blacknor were otherwise the best of a thin scatter of other grounded arrivals. 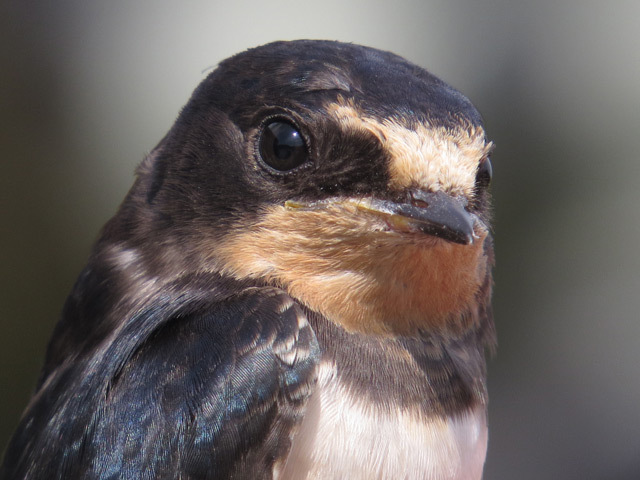 Swallows were gathering in some numbers at the Bill, where other overhead passage included 17 Yellow Wagtails, 8 Tree Pipits, 4 Grey Herons and singles of Greenshank and Redshank. Balearic Shearwaters were again lingering offshore at the Bill, with the total of 9 logged likely including some duplication. Painted Ladys and Hummingbird Hawk-moths were conspicuous in many areas, with more than 30 of the former scattered along East Cliffs at the Bill. 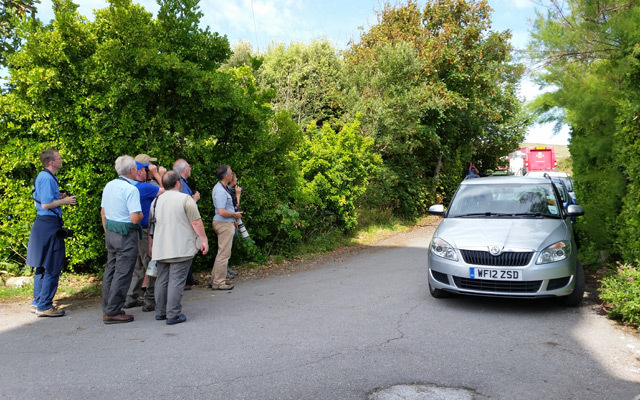 Overnight mothing was quite busy without there being any noticeable increase in immigrant numbers, with singles of Convolvulus Hawk-moth at Sweethill and Marbled Yellow Pearl at West Grove Terrace providing the best of the quality. 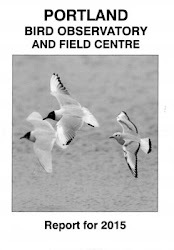 Just a reminder that the next In Focus field event at the Obs takes place between 10am and 4pm this Tuesday, 18th August 2015. Nice birding conditions and another small arrival of migrants today. 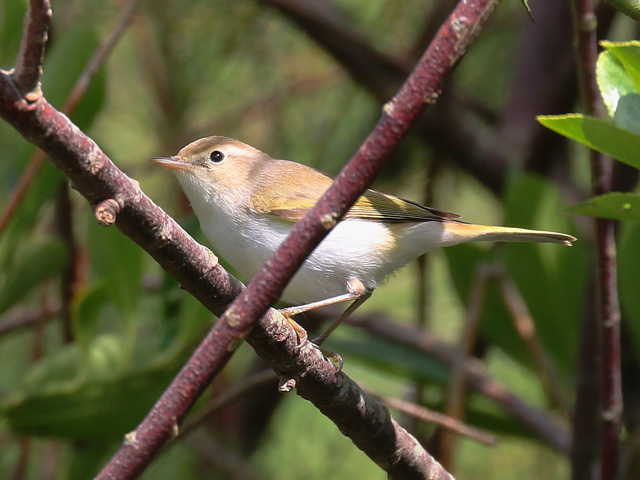 Willow Warblers again topped a three figure total at the Bill but the conditions were maybe too nice to have expected the variety of the last couple of days to be maintained. 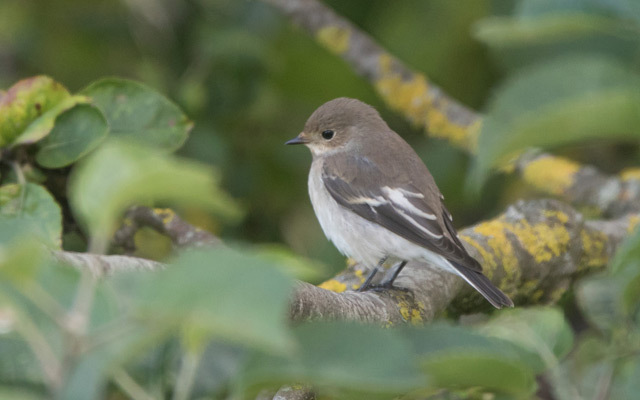 Another 4 Pied Flycatchers were grounded at the Bill/Southwell but the single figure totals of the likes of Yellow Wagtail and Tree Pipit there related largely to fly-overs; waders fared slightly better, with singles of Little Ringed Plover, Grey Plover, Snipe, Whimbrel and Common Sandpiper (together with the season's first Kingfisher) logged at times at Ferrybridge. The seemingly now customary 6 Balearic Shearwaters were again lingering off the Bill, where an Arctic Skua also passed through. 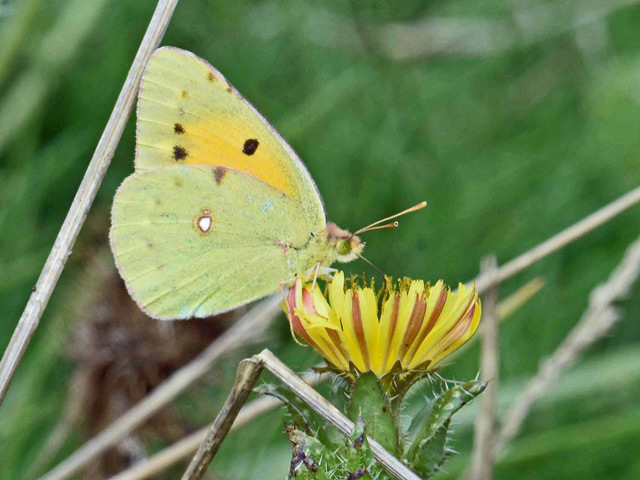 Painted Ladys and Clouded Yellows have become a good deal more conspicuous over the weekend, with reports of small numbers of each from throughout the island. With the temperature dropping quite sharply overnight there was little expectation of quality mothing so another first for the island - a Plain Wave at the Obs - was quite a surprise.